Presented by one of the leading brands, this Fairy Liquid Professional 2 x 5 litre pack ensures your business stocks are always kept high. The large 5 litre bottles have been finished with a comfortable handle for distribution while the screw down lid secures all it's contents during storage. Formulated for all general purpose cleaning and washing up duties, it promises to effectively cut through grease, food and grim to leave everything from your forks through to your pans gleaming. 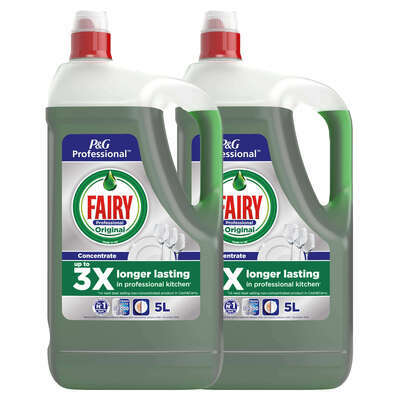 For the most convenient distribution, these tubs of Fairy liquid are easy compatible with our Pump Dispenser for 5 ltr 30ml Doses which reduces the amount of wastage produces.